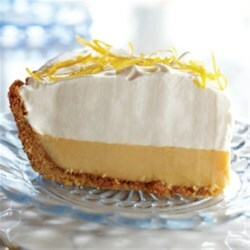 "You'll taste a burst of lemon flavor in every bite of this rich and smooth pie." Heat oven to 325 degrees F. Beat egg yolks in medium bowl with mixer. Add sweetened condensed milk and lemon juice until well mixed. Pour into crust. Bake 30 to 35 minutes or until set. Remove from oven. Cool 1 hour. Chill at least 3 hours. Spread whipped topping or whipped cream over pie before serving. Garnish with lemon peel, if desired. Sweet and simple and perfect for us! I included the zest of two lemons. This was really good! I used fresh lemon juice and the rind of two lemons. Came out very nice. Just enough tang. And very easy. Everyone loved it. My husband LOVED this. Perfect consistency. I, too, made my own graham cracker crust and baked for 20 minutes. Perfectly textured.